Justrite® Buy with confidence from an Official UK & Ireland main distributor. With service and best prices as our number one goal we can offer the full range of Justrite® products including: Justite® Type 1 (I) and Type 2 (II) safety cans, solvent waste containers, dip & wash tanks, plunger cans, oily waste bins, SDS document storage boxes and Justrite® smokers ceasefire bins. 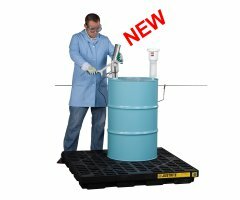 All Justrite Safety Cans – The full range including Justrite Type I (1) and Type II (2) Safety Cans, Justrite Laboratory Safety Cans, Justrite Waste Cans, Justrite Liquid Plunger Cans, Justrite Oily Waste Bins and Justrite Wash and Rinse Tanks. Justrite Flammable Storage Cabinets - Justrite Sure-Grip EX cabinets are constructed of sturdy 1mm - (18-gauge) thick double-wall, welded steel with 38-mm of insulating air space for fire resistance, finished with a durable lead-free epoxy/polyester powder-coat finish provides excellent chemical resistance. Justrite SDS Document Storage Boxes - Keep your important papers readily available while protecting them from moisture and dirt. Safely store manuals and documents in these weather-resistant polyethylene storage boxes.